Young adults still make up the majority of opioid overdose deaths in Monroe County, but the fastest-growing age group in that data is seniors. WXXI’s Brett Dahlberg has more on how the opioid epidemic is affecting Monroe County residents age 50 and older. Dave Lana was 61 when he died of an opioid overdose in January. It was fentanyl, his wife, Angela, said. He got the drugs in Monroe County and overdosed a few miles away at his father’s house in Ontario County. John and Angela Lana host grief groups in an Irondequoit garage for people who have lost a loved one to an opioid overdose. Angela's husband, and John's brother, Dave, died of an overdose this January at 61. Dave had struggled with drug addiction since he was a young teenager, said Angela and his older brother John. John, now 64, said he’s in long-term recovery from his own addiction, and he’s been drug-free for almost 20 years. Still, he’s had his own close brushes with death. Both brothers have had successful careers. Dave was a union carpenter – he was doing some repair work at his father’s house the day he died, Angela said – and John was a jockey and horse trainer. Neither fits the most common profile of a person addicted to opioids. But both are reminders of addiction’s ability to target anyone, say mental health experts, including – and especially – people over 50. That group is the fastest-growing age group for opioid fatalities in Monroe County, up almost 400 percent between 2014 and 2017, according to data from the medical examiner’s office. Last year, the oldest person to die from an opioid overdose was 82, the sheriff’s heroin task force said in a July press release. “We need to think about the older population and their susceptibility to opioid addiction,” said Cathy Saresky, who directs clinical innovations for Rochester’s Catholic Family Center. The organization provides services for people with drug addictions. “We have to pay attention. Our population is shifting and getting older,” Saresky said. At Lifespan, which provides resources and support to seniors in the Rochester area, the brochures that describe the geriatric addiction program had to be revised recently to emphasize information about opioids, said Paul Caccamise, the organization’s vice president for programs. Caccamise said Lifespan’s leadership realized they needed to address the emergence of opioids as a primary contributor to addiction in older populations. It starts often with prescription painkillers. The elderly population has a higher-than-average rate of major medical operations, and people are often prescribed strong painkillers, like oxycontin, codeine and Vicodin, to dull the discomfort, said Caccamise. But those prescriptions are expensive, and they eventually run out. 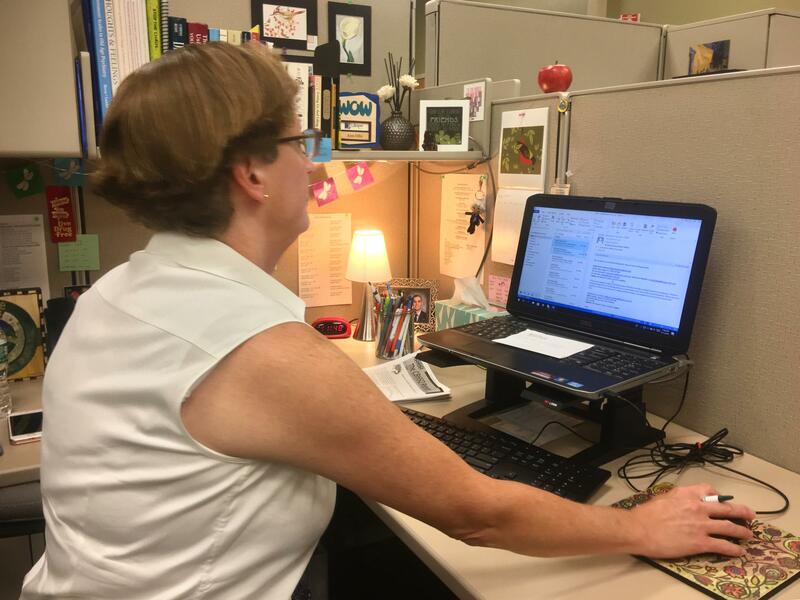 Ann Olin says she spends little time in her cubicle at the Catholic Family Center offices in Brighton. She's often out in the field, she says, meeting with clients in the center's geriatric addiction program. John said his doctors never asked him if he was OK with opioids. Olin said that’s a story that’s all too common: older adults developing a dependence on legal pills, and health care workers who don’t realize that the elderly can get addicted, too. When WXXI News visited her office in Brighton on a Friday morning, Olin had already returned from visiting a client at his home. “Often I come in very early,” she said. “Yesterday I had three clients in the morning and then I came back for lunch.” Olin said it’s not uncommon for her to see five or six clients in one day. In her office at the Catholic Family Center headquarters in downtown Rochester, Sabrina Sharpe, a clinician there, described a similarly heavy caseload, with 34 current clients. “I have all different walks of life: all ages, all backgrounds, all different stages of recovery.” Clients over 50 make up a sizeable, and growing, portion of that total, she said. 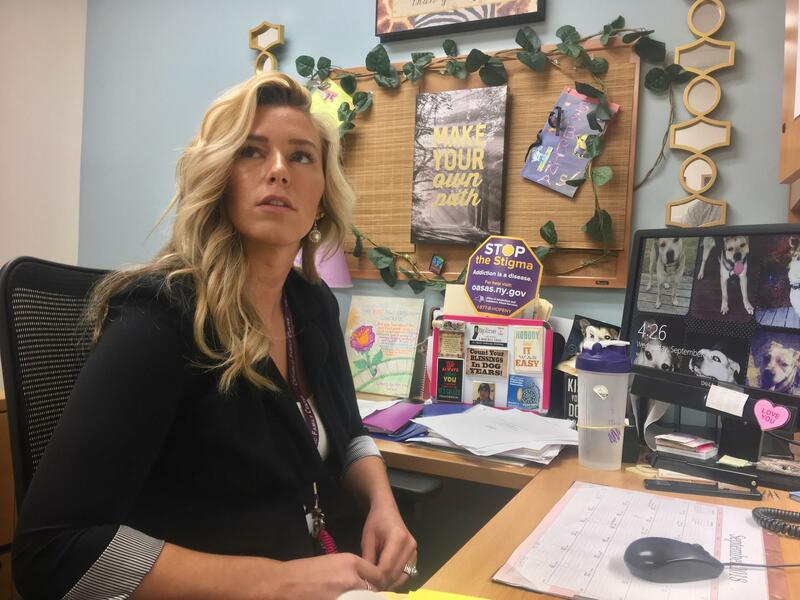 In her office at the Catholic Family Center in downtown Rochester, Sabrina Sharpe meets with a growing number of people over 50 who are addicted to opioids. But even with the best support, Olin said, there are barriers to getting addiction treatment to the older generation that don’t exist with younger clients. “The older adult population is thinking, you know, we don’t air our dirty laundry; we don’t talk about our problems,” she said. And, experts say, the symptoms of opioid dependence are similar to aging. For that reason, they can be difficult to detect. Leaders at Lifespan and Catholic Family Center both said one of the most important things anyone can do is check in with their older family members. The better people know their families, they said, the more likely it is they’ll catch a problem early.